For the last five years, Mel (The Terrain Tutor) has been sharing his passion – teaching people everything he knows about building terrain for tabletop wargaming. Let’s help our mate Mel push it over the line and check out his other stretch goals on the Kickstarter! Has been building terrain for almost as long as he can remember. When he was five, Mel built playsets for his little green army men in the corner of the craft store his mother ran. He was often assisted by model railroaders who were regulars at the store and, by the time he saw his first White Dwarf magazine at age 15, Mel was primed for a life of building terrain. Mel has travelled the world, as a medic in the army, a physiotherapist, and even a salesman. Working with people from all walks of life has enabled Mel to look at things from many different perspectives. It is this approach that he brings to his successful YouTube channel (The Terrain Tutor). 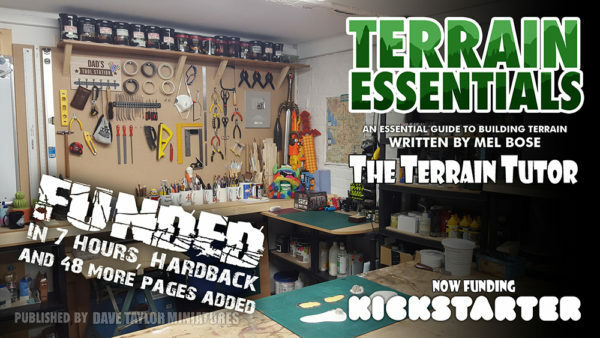 For the last five years, Mel has been able to make a living from sharing his passion – teaching people everything he knows about building terrain for tabletop wargaming, for hobbyists, clubs, displays, and for dioramas – and it’s that passion and knowledge that he is bringing to this book, Terrain Essentials. Dave & Mel are using this Kickstarter campaign to fund a printed version of the book – Terrain Essentials – a 96+ page book perfect to add to the collection of anyone with an interest in creating excellent tabletop terrain, regardless of purpose or the builder’s ability. Because the plan is to cover each of these chapters in as much detail as possible and to give you as much information as they can, Mel & Dave have a number of stretch goals planned that will help them provide more in-depth knowledge on each of the techniques used and sample builds shown in the book. 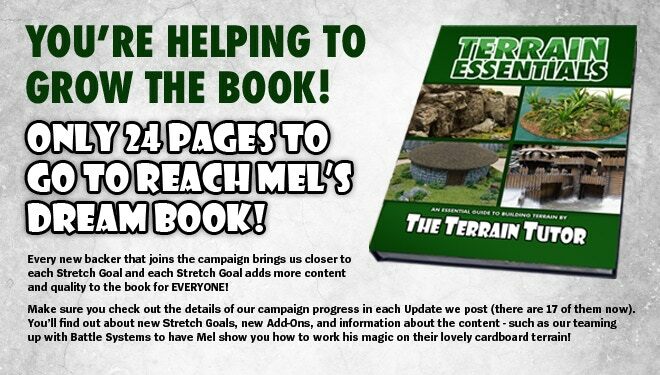 As of today, they’re well on the way to creating Mel’s dream book, but still need that last bit of help to get it across the line and reach all the stretch goals. 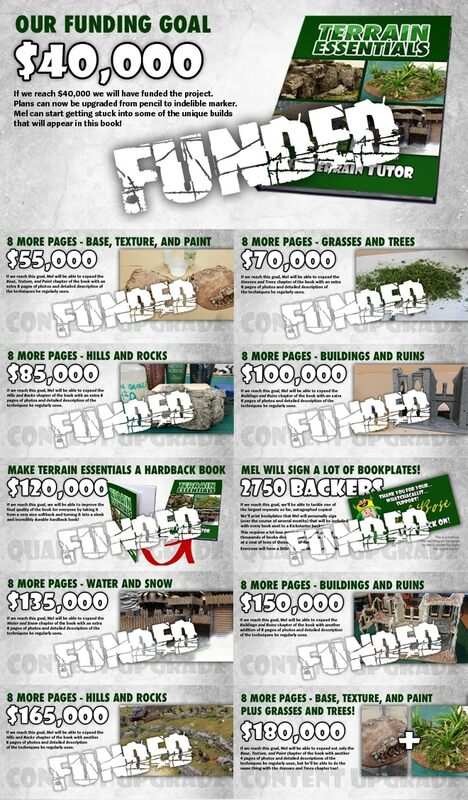 Over the course of the campaign, they’ve unlocked an additional 48 pages of great terrain content and would love to add another 32 pages to round it out and make this the “go to” terrain building book for many years to come.